Productivity Mini Seminar Series: Thank You All Participants! December 12, 2012. It's 12-12-12 Seminar. We didn't even notice it a day before the seminar! HP, AMD, Avnet and Sentra Grafika Kompumedia would like to extend our greatest gratitude to all participants, ranging from resellers and engineers/designers. It was a pilot seminar for next year following seminars. The seminar surely opened up all of or our mind in getting to the next level of efficient investment with huge productivity gain. No one couldn't agree more to this. The use of DRAFTSIGHT and BLENDER 3D, gives lots of promises in saving the investment while extending productivity as well, without the fear of getting any legal actions, as they come for FREE. The investment focus is to have the best hardware from HP and AMD, to run the application. One of the most interesting thing in the seminar was the open discussion session. Dozens of questions and interactive discussions between the participants and presenters showed the huge interest in the solution that cost less to them. This is the goal for all of us in delivering the proven solution for most customers. Last words but not least, we will conduct more seminars in series to answer most if not all, needs of the graphics solution from our customers' end. WE'LL SEE YOU ON THE NEXT EVENT. December 11, 2012. HP and AMD are proud to deliver another Productivity Mini Seminar, which covers on BREAKING YOUR PERFORMANCE BARRIER WITHOUT KNOCKING OUT YOUR BUDGET. Details are the following. Register yourself and your colleagues by submitting your name and company details to: mktg1_sgk@dnet.net.id. Each participants will receive FREE Professional Grade 2D CAD Application from Dassault Systemes and FREE 3D Modeling and Animation Software. December 11, 2012. Sentra Grafika Kompumedia, is chosen by Televisi Republik Indonesia (TVRI) to reshape and enhance their 3D graphics artists skills and knowledge during annual training at TVRI's Training facilities (Pusdiklat TVRI, Jakarta). 12 Participants were able to learn and master Blender 3D to accommodate most graphics demands and requirements, switching from a commercial application to a free, open source 3D application which has grown its reputation in the industry. SGK is honored for the trust given by our government national tv station. November 19th, 2012. Sentra Grafika Kompumedia aims for the best achievable team to partner with the customers, in order to grow the business along. Available jobs opening is now informed under JOBS menu. November 5th, 2012. Indocomtech 2012 was ended last night with all the information delivered, sales and all glamorous IT event footprints. 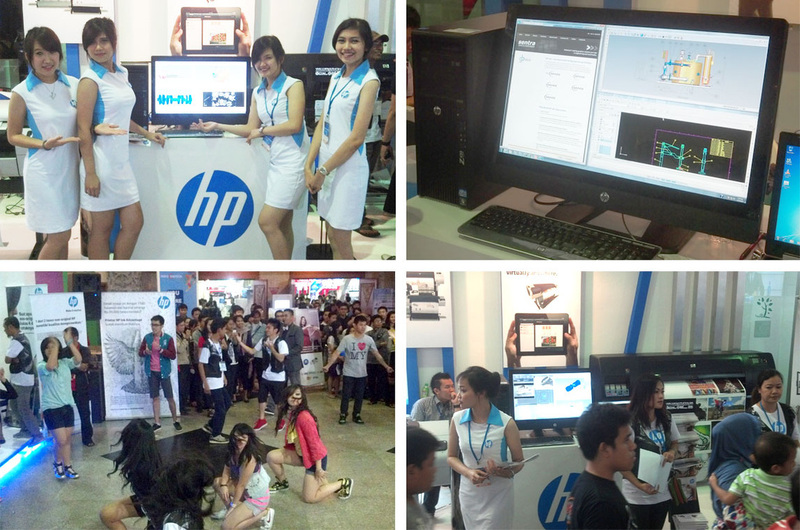 Sentra Grafika had been receiving outstanding response from visiting customers who were so amazed with the HP Z1 Workstation. It was a great honor that we could share and deliver any related information about HP Workstation series for both personal and mobile. We were also delivering education that received positive response from most of the visiting customers about what we think as a smart investment. We will be seeing you in the next event. Until then, keep on visiting our website for further information. October 31st, 2012. Indocomtech 2012 was opened on Oct 31, 2012. 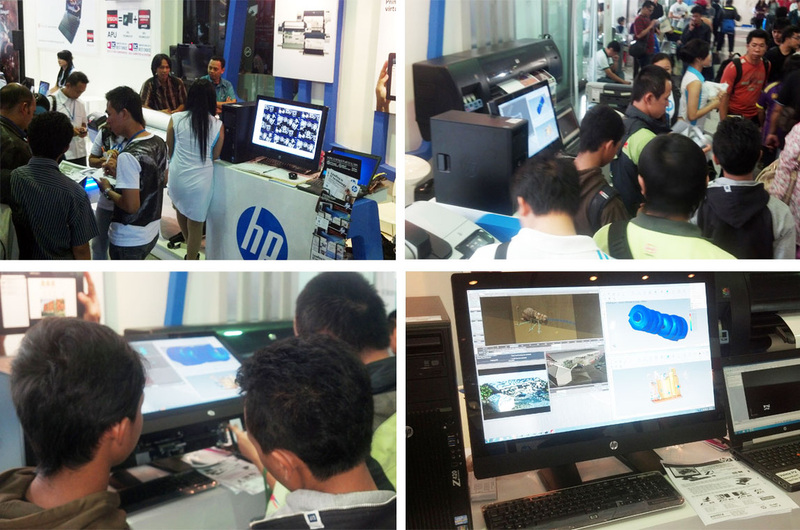 HP and Sentra Grafika Kompumedia have been very excited to show HP Personal and Mobile Workstation series to enormous numbers of the Indocomtech's visitors, every day. We received huge responses and interests in HP Z1 Workstation. Thanks to its revolutionary design and performance. During the show, the Z1 could take up 2 Newtek's Lightwave 3D demo scenes rendering, while showing up 2 Solidworks scene files real-time animated assembly playback with 3D acceleration from Nvidia Quadro 4000M, without a hicup at the same time. People were so fascinated when they saw the Z1 being opened to reveal its components inside. Check out our booth at Indocomtech, right next to the main entrance, in Hall A.
October 25th, 2012. Customers, graphics artists, enthusiasts are invited to attend Pixar's RenderMan Users Group Meeting at Siggraph Asia 2012. We hope you are able to join us at the Singapore EXPO Convention and Exhibition Centre on Friday, November 30th, 2012 for an evening dedicated to the RenderMan Community. This is a great opportunity to hear the latest technical developments. Space is limited, so YOU MUST Register today to reserve your seat via the link below. The deadline is Tuesday, November 27th, 2012. October 25, 2012. In order to share some thoughts, we now have an section called ARTICLES which consists of things, updates, and 2nd opinions. October 9, 2012. Showing their commitment to support all of their resellers' hardwork, Avnet conducted an astounding event to gather their resellers in Jakarta Theatre. Honorable guests were most of Avnet's principals and all respected resellers. SGK were able to capture some memorable moments as it's so fortunate that the event shared the same date as one Indonesian Diva's birthday, a pop singer, Rossa. Congratulations Avnet for having such a spectacular event! And also, Happy Birthday Rossa! October 5, 2012. HP was cordially invited to present and introduce high performance computing to Bunda Mulia University, during its annual EduFest 6.0. It was also the time in announcing the special program for educational institution for HP 8570w for students which delivers the chance for students to see highly acclaimed HP Mobile Workstation and opportunity to own HP Mobile Workstation at affordable price. 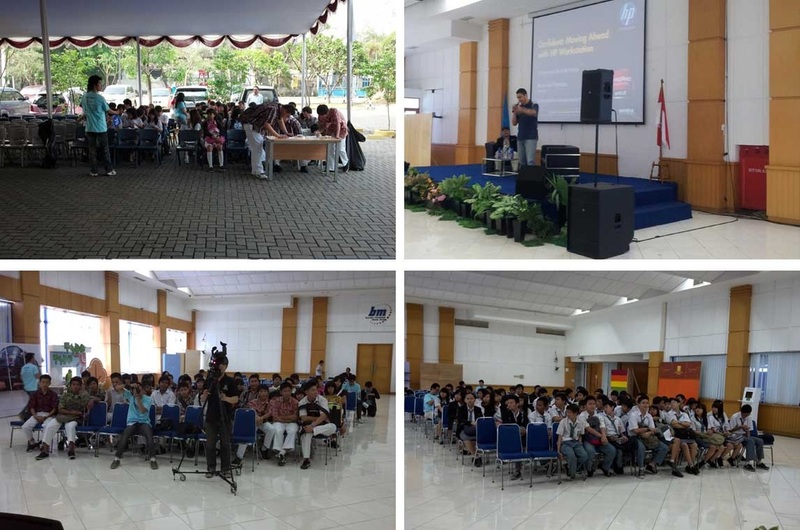 Bimo Adi Prakoso of SGK shared some experiences in having the HP Workstation series along with AMD graphics as education solution system to meet the education needs and real world challenges. Along with him during the event were Bimo Yuwono Prabowo of HP Indonesia and Suryo Widiantoro of Universitas Bunda Mulia. Welcome Pak Adi Antariksa! GB Labs Director of Sales, USA. October 3, 2012. We are so honored to receive the visit of one of our trusted principles, GB Labs. 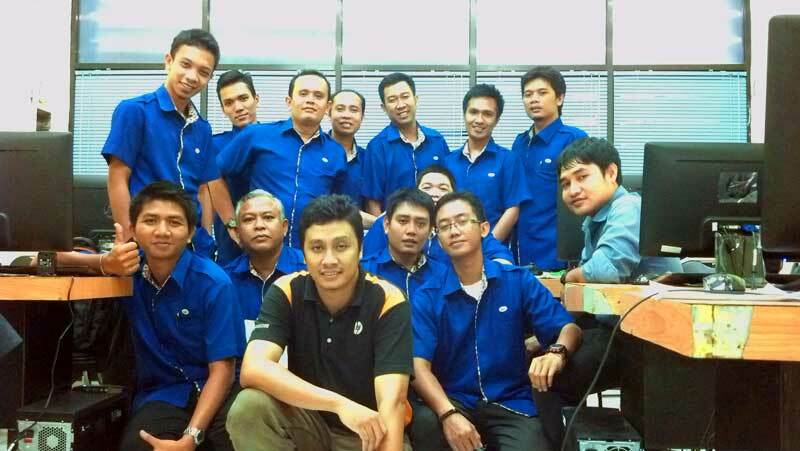 Adi Antariksa, GB Labs Director of Sales, USA, was keen to visit us on Oct 3rd 2012, and giving a warm technical training himself to Sentra Grafika Kompumedia. Adi Antariksa said "I'm looking forward to continue working closely with Sentra Grafika, along with SGK's commitment and focus, to deliver GB Labs products family to answer the needs of high performance workgroup storage in Indonesia." October 2, 2012. 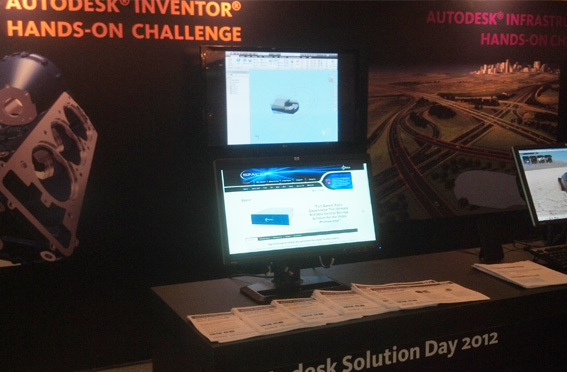 Sentra Grafika Kompumedia PT was representing Hewlett Packard Indonesia in Autodesk Solution Day 2012, Oct 2nd, 2012 in Ritz Carlton Hotel @Pacific Place. SGK was showing advantages of new HP Personal and Mobile Workstation, along with ultimate workgroup storage solution from GB Labs, UK. Both HP Workstation and GB Labs solution, provide ultimate team-up solution for multiple HP Workstation with extreme performance shared storage for manufacturing, engineering, design and media entertainment market. With us, were Erric Budiono of HP Indonesia, Risia and Tyas of Avnet Datamation. September 29, 2012. 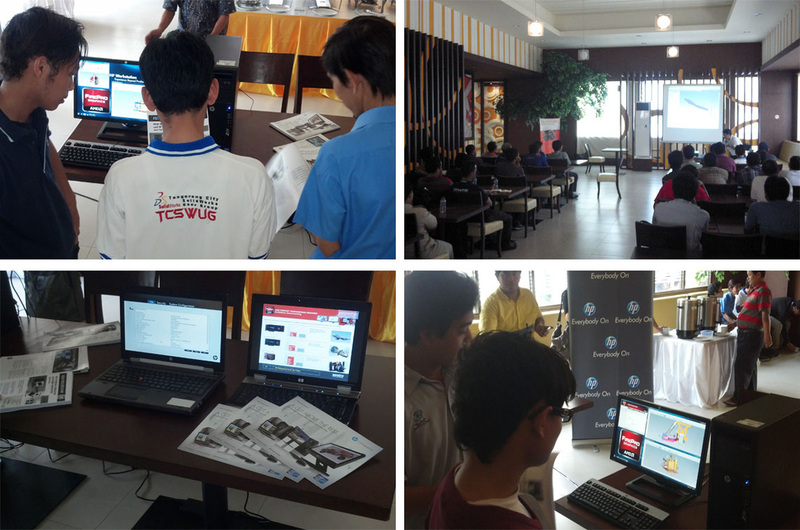 Held in Celcius Cafe and Grill in Tangerang City, SGK showed the ultimate geometry acceleration with AMD FirePro desktop and mobile graphics series to run Dassault Systemes Solidworks. It's the second time SGK was invited to participate and share the solution to team up with Solidworks distribution channels such as Arismadata and Trimedia. Bimo Adi Prakoso of SGK was showing a solid collaboration between new HP Workstation series and AMD FirePro graphics, delivering uncompromise productivity in Solidworks. Sudikin, Head of Tangerang City Solidworks User Group was so pleased to have SGK team with the TCSWUG. September 19, 20120. Sentra Grafika Kompumedia PT was honored to participate in Delcam Asian Technical Summit 2012, Sept 19-21 2012. Held at Aryaduta Hotel in Lippo Karawaci, Sentra Grafika and HP showed the new HP Personal and Mobile Workstation series to run most demanding Delcam Application such as PowerMill and PowerShape. 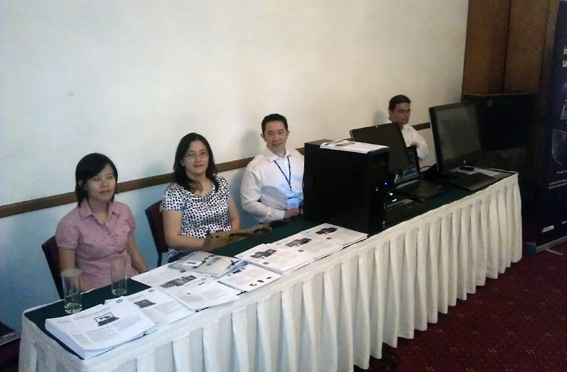 With us were Erric Budiono and Susianty of HP Indonesia, along with Risia of Avnet Datamation.